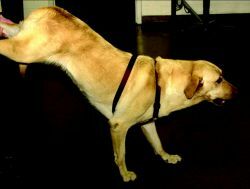 a test for postural reactions in which the animal's hindquarters are supported and walking on the forelimbs is forced. Symmetry of movement, position of the head, neck and limbs, and abnormal movements are observed. Necessarily, only used in neurological examination of small animals.